Roger L. Patrow, 90, entered into the loving arms of Jesus Tuesday, Nov. 27, 2018, with his family by his side. He was born March 24, 1928, the beloved only child of Glenn Patrow and Mattie (Jarosch) Patrow. Roger grew up in Chippewa Falls, which he felt was the most wonderful place to grow up. There he had special memories of living near Irvine Park, swimming, fishing and playing with friends. It was an idyllic childhood. He graduated from Chippewa Falls High School in 1946, where he played football, basketball and tennis. He loved sports and continued to enjoy them as a spectator until his last days. He was commissioned into the U.S. Army, where he served in Korea. He attended the University of Wisconsin and graduated with a Master’s in education/counseling. Throughout his life he felt a call to ministry, causing him to attend the Lutheran Bible Institute, where he met and fell in love with Arlette Larson, who he married in 1959. They were blessed with three children, Ruth Ann, Kristin Joy and David Roger. In 1961, he graduated from Luther Seminary with a Master’s in divinity. At that time he felt called to the Mission field and served in Ethiopia, Africa. He worked at the Ethiopia Evangelical College, where he was a teacher and then became director. He always held a great love for Ethiopia and her people in his heart. In 1981, the family had the privilege of welcoming Taddese Desta into our lives. 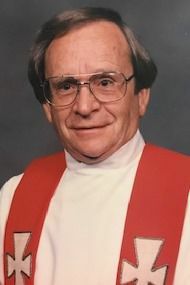 Roger served congregations in Escanaba, Mich., Connell, Wash., La Grande, Ore., and finally Conway, Wash. Roger enjoyed all his congregations and was well liked by his parishioners for his good sense of humor and his preaching. He worked for God’s justice in the lives of individuals, especially those who were the most vulnerable. Just a small town Wisconsin boy who traveled the world. But most of all he was a Pastor who wanted people to know God’s great love for them. He is preceded in death by his parents; and two infant grandchildren. He is survived by his wife, Arlette; daughters, Ruth Ann (Greg) and Kristin (Mike); and son, David (Jennifer); as well as Taddese Desta (Emebet); and nine grandchildren. A memorial service was held Saturday, Dec. 15, at St. Luke Lutheran Church Spokane, Wash. Memorials may be made in honor of Roger to either St Luke’s building fund or to “Water to Thrive” www.watertothrive.org.